Take part in the ancient tradition of transhumance by joining this 6-day trail through the French and Italian alps, moving horses to their summer grazing. Riding from the sea up into the mountains, the trail passes through the lush Italian pastures of the Riviera dei fiori (Riviera of flowers), famous for its azure waters, alpine and medieval towns. Riders will be able to enjoy the remarkable landscapes of this part of the Italian Riviera before reaching the steep pastures of the snow-capped alps. Suitable for fit intermediate riders onwards. 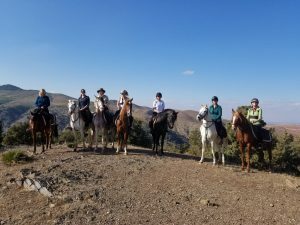 Riding Ability Required: Must be confident at walk, trot and canter and riding/leading horse on steep terrain. Transfer: 2019: From Nice Airport or train station, €50 each way. From Menton train station €25 each way. Discover the wild Ligurian mountains and coastline on this 8 day, point-to-point trail crossing from France into Italy on willing, sure-footed horses. Ride through mountain passes and pine forests before visiting ancient, medieval villages. This trail is for adventurous riders who want to get away from it all. Accommodation is in hotels and B&Bs in small villages along the trail. there is also the option to undertake a shorter version of this ride, completing a 6 day ride rather than the full 8 days. 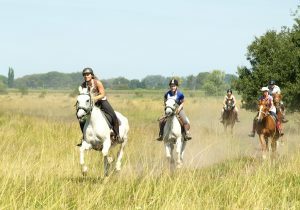 Riding Ability Required: Riders should be confident in walk, trot and canter in open spaces and on steep terrain. Riders must be able to mount and dismount unaided. Transfer: From Nice Airport or train station, €50 each way. From Menton train station 25€. Transfers payable on site.